Thomas Taylor Interview – Getting to the Hart of the matter. It was hard to know where to start with this interview as there is so much I want to ask! I think I’ll start at the beginning with a question that is one of my favourites. What (or who) did you want to be when you were seven? What sort of kid were you, what entertained you as a small person? Hi, Dawn, and thanks for interviewing me. This is a fun question to start with. Do you remember Joe90? I looked a bit like that, only scrawnier and with NHS specs. I was a loner, who secretly wanted to be either Doctor Who or Luke Skywalker, or – if possible – both. Lego and small metal figurines were everything to me. Girls were a long way off. ·I always find that question fun, but I can’t quite picture you as Joe90! So you were very imaginative as a child, good start! You illustrate your own books and covers, and your background is in illustration, but your books are wonderfully written – which discipline do you prefer; illustrating or writing? Thanks for the compliment. As for which I prefer, it has to be the one that’s going the best at any given moment. That sounds like a cop-out, I know, but they are so different that it’s hard to compare. In general, I think I find writing comes slightly more easily, but only once the ideas are flowing. These days I think of myself as a writer who also draws. ·I am glad to see that you are still creating picture books (my daughter loved George and Sophie’s Museum Adventures when she was little!) A lot of your books you have written and illustrated yourself, but when you are working with an author on a picture book, how does that process work? It’s nice to hear someone remembers George and Sophie! There isn’t much to the process, beyond being sent roughs and invited to comment at various stages. It’s rare to meet the illustrator these days. Choosing the right illustrator is a vital part of an editors’ job, and I’ve learnt to trust them, however long it takes. My next picture book, Too Many Tickles (out in Feb next year with Macmillan), was written over four years ago – it took that long to match up an illustrator with the text. Penny Dann was definitely worth waiting for though. ·I suppose that there will always be people connected to books that the creators don’t get to meet, but it must have been a strange (and wonderful) experience having David “The Hoff” Hasselhoff reading yours and John Kelly’s picture book, Jack’s Tractor, aloud on CBeebies. How on earth did that come about? It was strange and amusing all at once. I remember as a child watching David Hasselhoff as Nightrider (in my breaks from being a timelord or a Jedi knight). As for how it happened, I didn’t even know it was happening at all until someone on twitter said they’d just watched it. At least, I knew the BBC had bought the broadcast rights for Jack’s Tractor, because I’d signed a contract six months earlier, but I’d since forgotten all about it. ·Let’s get out and about, I know that you do brilliant school visits, and most authors have a hell story and a heaven story about their school visits – can you share any of yours with us? My worst school visit was one of my first. I turned up at the school having verbally agreed to ‘visit a few classes’ over the course of the day, only to be given a schedule that had me spend half an hour with each of EIGHT classes of all key stages, with no time allowed to dash between them. When I finally reached the end of the day, a complete wreck, I was handed paintbrushes and some pots of unsuitable emulsion and asked to paint part of the school mural! I was young and stupid enough to say yes. I didn’t get home till after dark, having been kicked out by the school caretaker. Moral of the story: agree in advance, in detail, what you will and will NOT be prepared to do. ·Oh my word! Wise advice for all of us doing school visits! 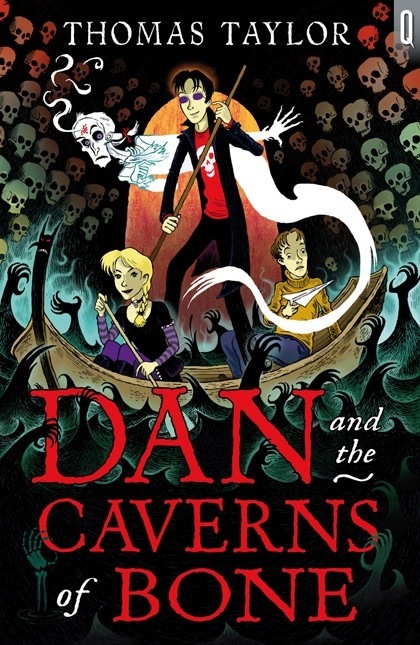 In the last few years you have been concentrating more on books for older children, kicking off with Dan and the Dead in 2012. Dan can see ghosts and speak to them, and in this very witty and entertaining story he helps ghosts sort out their problems. I am greatly drawn to your work because we share a fascination for ghosts. So what fascinates you about ghosts? 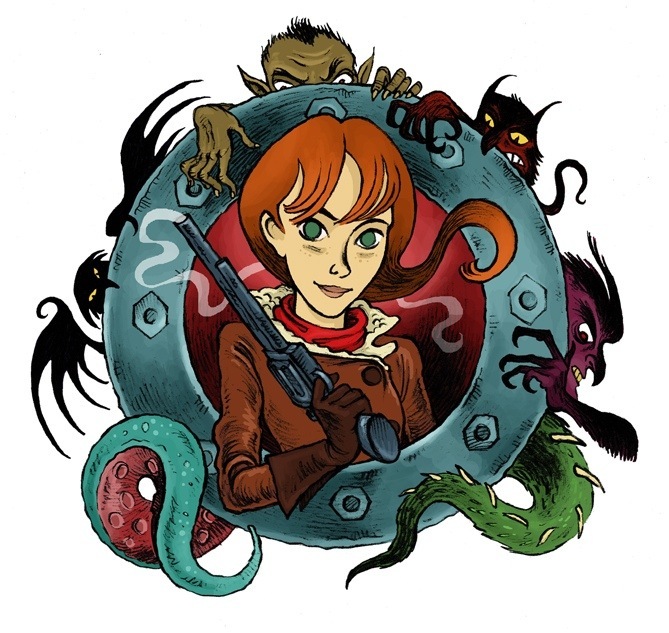 Your book for older readers – Haunters – is a thrilling adventure with wonderfully original concepts like dream-terrorism and the ability to time travel through dreams, more ghost-like episodes…. How different was it writing something so much darker? Is there another Haunters in the pipeline? Dan and the Dead was written using conventional ghost story material left over from writing early drafts of Haunters, which is in many ways an inverted ghost story. I found Haunters very difficult to write, not least because I wrote the first draft without doing any plotting at all! You don’t panster your way through a story that involves two changing interconnected time-lines, you just don’t. It took me years to straighten that tangle out and turn Haunters into the fast-paced thriller it is today. I’m very proud of the book now, but it nearly blew a fuse somewhere in my brain. I learnt a hell of a lot in the process though. As for a sequel, I have plotted out a second book called ‘Dreamers’, but I had another unrelated story by then, one that was calling much more loudly. I’ve written that now, but I don’t want to talk about it until I hear back from my editor. All I’ll say is, it has drawings in it. Oh, and only one timeline. 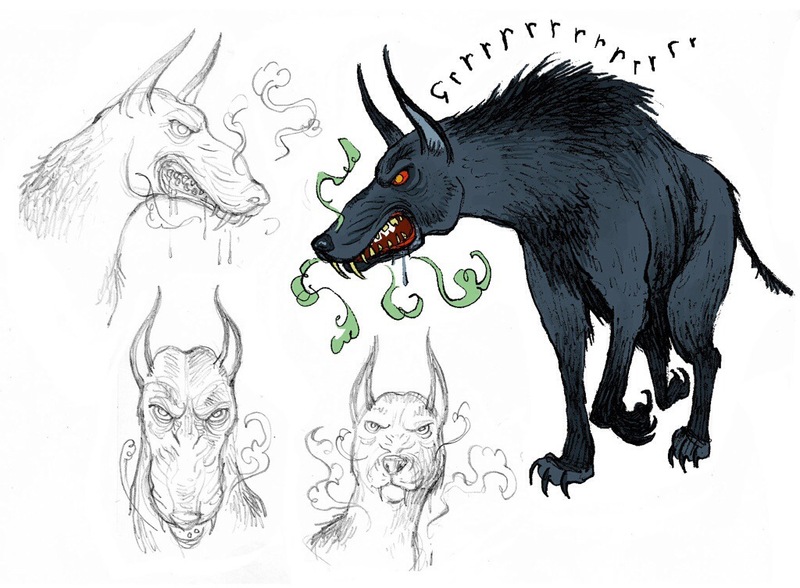 ·Speaking of drawings, I’m very excited to see that you are collaborating on a graphic novel project with Marcus Sedgwick. Scarlett Hart looks brilliant, and I’m really enjoying your blog where you share sneak peeks at the work in progress, the sketches so far are fantastic! 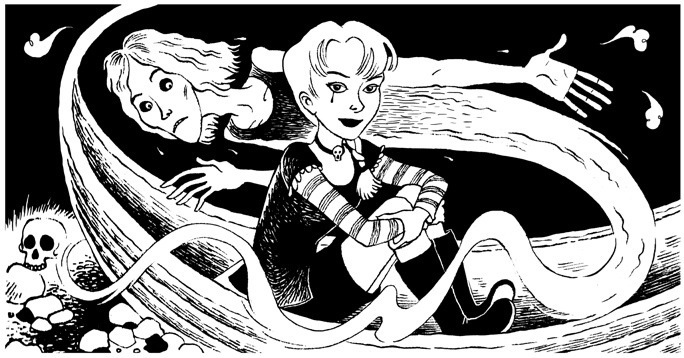 Are you enjoying the process, and how different is it working on a graphic novel? This project is terrifying and exhilarating all at once. In many ways I’m coming home, since graphic story-telling is where I started as a teenager, and the world of comic books has always beckoned. I often think I should have gone into comics after art school instead of illustrating picture books. Either way, it’s taken me along time to find my way back there. As for the process, it feels like the classic ‘you write it, I’ll draw it’ relationship on one level, but Marcus and I are very much co-creators of Scarlett Hart. We just have our own domains, that’s all. He often suggests changes to the look of the book, and I feed through to him any narrative ideas I may have. Actually, it’s an especially fruitful relationship because I know about writing process myself, whilst Marcus draws very well, and understands the project visually. Anyway, we haven’t killed each other yet! ·OK, I’m afraid we can’t have an interview without asking you about THAT cover (in case you have been living in a cave, Thomas was the illustrator of the iconic first cover for Harry Potter and the Philosopher’s Stone.) That must have been an exciting time for you, but what are your feelings on it all now the dust has settled? Harry Potter has cast a long and sometimes chilly shadow over my career. I try to keep my distance from it now. You can read more about my uneasy relationship with HP on my blog. ·Good response, and the post about it on your blog offers up a lot to think about for young illustrators. What advice would you give to young writers/illustrators starting out now? What should they look out for when starting out on this long creative road? Both writers and Illustrators need to practice their art all time. Writers should also be reading insatiably, while illustrators should be constantly looking at what’s new in their field. Neither should worry about style (as I did, endlessly). Your own personal style will develop out of practice and will be as unavoidable as growing up. ·So true, I think that finding your voice only happens when you stop straining to hear it. So what next? When can we expect to see Scarlett, and is there more Dan in the pipeline? I’ll need most of 2014 to produce the art for Scarlett (gulp!). The publication date is some time off yet (and I’ve been told to keep it secret). I’m writing the third Dan adventure right now, and will blog about it soon. I’m a bit coy about works in progress, I’m afraid, but I can tell you that in contrast to his subterranean brush with death in the catacombs of Paris (Dan and the Caverns of Bone), Dan will need a good head for heights in Dan and the Shard of Ice. That sounds thrilling, and I’m trying not to speculate (spoilers!) Thank you so much for agreeing to be interviewed, I’m massively looking forward to Scarlett Hart and will be keeping an eye on your blog for more sneak peeks. Thank you, Dawn! And good luck with your own excellent writing and projects. Stop press….The new website for Scarlett Hart is under construction and you can follow the whole process for yourself here. It is up and running and added to all the time, so bookmark it for news along the way. If you are looking for the definitive answer to the question of who is the mysterious wizard on the back cover of Philosopher’s Stone – easy, it’s here! Mystery solved.